The Democratic National Committee's decision to hold its 2020 convention in Milwaukee is even drawing some praise from the other side of the political aisle. Former Gov. Scott Walker, a Republican, said he thinks the 50-thousand visitors the 2020 DNC is expected to draw to the Brew City will be an economic win. "It's super for Milwaukee. It's super for the state. Their money is not red money, it's not blue money, it's green money," Walker said. The former Governor said the common assumption is that the 2020 DNC will play a big role in energizing Wisconsin's Democrats. 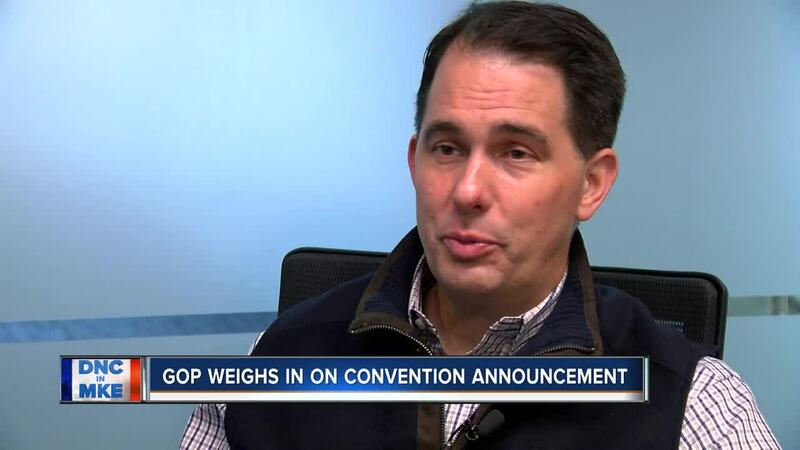 But Walker thinks the convention could also energize conservative voters. "Is there any Democrat left in Wisconsin who's not already motivated against the president?" Walker said. "I think the fact that you're going to have not just all these Democrats here, but some of the most extreme elements of their party here and focused on Milwaukee and the state of Wisconsin, I think that might motivate not only Republican voters but Independent voters who might look at that and go, 'wait a minute,'" he added. Edge Messaging's Brian Fraley, a Republican strategist, said he's not surprised Democrats chose Milwaukee for their 2020 convention given the state's significance in Presidential elections. He said the media coverage the convention draws presents a nice opportunity to rebrand Milwaukee nationally. "You're going to see a lot of Harley Davidson, a lot of bratwurst, a lot of music, and manufacturing," Fraley said. "That's all going to be good exposure for the city." Fraley said the convention also presents an exposure opportunity for local, GOP elected officials. The media will ask many of them to respond to Democrats' speeches on the convention floor. "Local Republicans are going to be turned to as the face of the loyal, local opposition," Fraley said. "When a party presents its platform, it's saying, 'this is what we believe in,'" Fraley said. "So (the DNC) does provide an opportunity for Republicans to hold up that Democrat platform and say, 'This is what they're saying. This is why we disagree with it.'"